Those of us with green fingers who live in a sectional title property can feel frustrated, as we often don’t have our own garden. 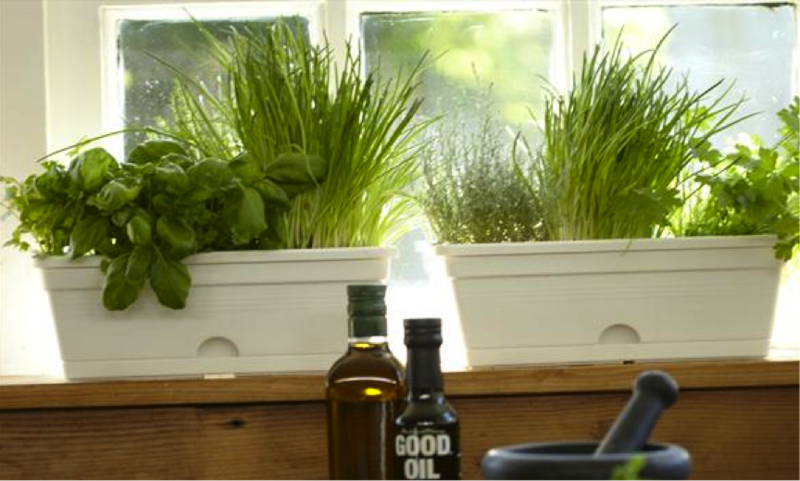 A windowsill herb garden is a low maintenance outlet that allows us to beautify our homes with vibrant living green plants and have pot-to-pan fresh herbs to jazz up our cooking. Preferably one that receives 5hrs of sunlight per day. You can buy ‘ready grown’ small herb plants from the nursery and transfer them into your own pots/containers at home. Otherwise, you can buy the herb seeds and grow them from scratch. Popular choices are chives, basil, lavender, oregano, sage, parsley, mint, rosemary, time and bay leaves. Use either individual ones that are 6-12 inches deep and 6 inches wide or one long one, also 6-12 inches deep and as wide as you like. 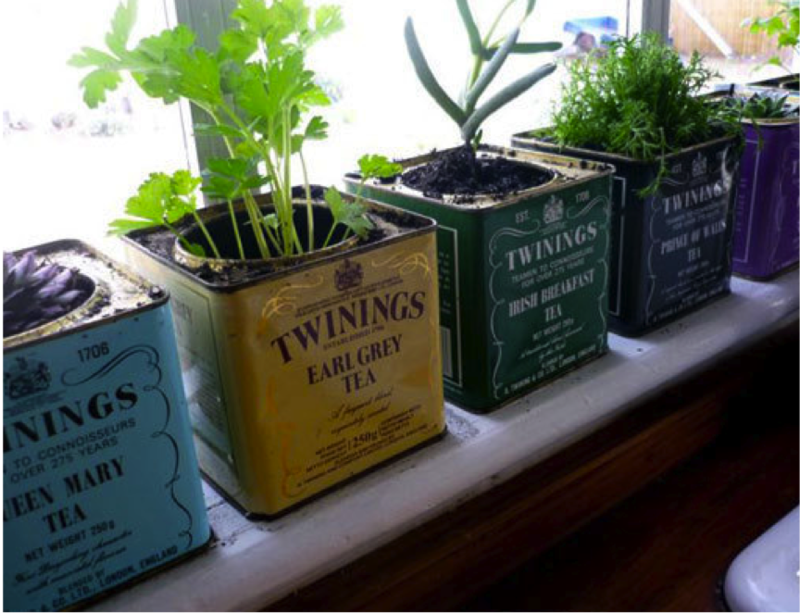 Feel free to get creative with your pot/container choice, almost any correctly sized container will do (look at the use of the Twinings tea tins above– absolutely awesome!). This drains better than garden soil and reduces the chance of soil diseases. Labeled for use on edibles. Place 2-3 inches of soilless potting mix at the bottom of your container. Place the herb plant on top and add more of the soilless potting mix pressing it firmly around the plant. Save some space for water – leave the inch below the top of the container free. Water sparingly. Herbs don’t do well when sitting in pools of water. Give your herb plants time to get used to their new home. Once they start growing it means they have acclimatized and you can start using them. Fill your container with dampened soilless potting mix, make sure to leave an inch free at the top. Sprinkle 3-5 seeds on top of the soilless potting mix. Cover seeds with a light sprinkle of soilless potting mix and gently press it down. Cover each used container with a plastic bag to seal in the moisture. Make sure you keep the soil moist. Once you see your little guys starting to sprout, remove the plastic bag and water sparingly whenever the soil looks dry. Once your herbs look ready for use you can snip off the tips. Make sure you leave at least 2 inches of the plant intact so it can easily regrow. For bushier herbs like parsley, snip from the sides – you can cut whole stems, just leave enough of the plant in tact in the middle to allow regrowth. Finally, feed your beautiful herbs once a month with a fertilizer labeled for use on edibles. I am obsessed with this! It is so flipping cute! I have wanted to grow my own herbs for a while now and I can’t wait to try this! A good idea BUT if you have any balcony [be it an EUA or part of that Section]below you, PLEASE be careful in ensuring that water from your plants , or your watering of them, does not cause water to drip onto the balcony below. It causes unbelievable and unnecessary stress. Absolutely right! Thank you for making this comment as you make a very valuable point which applies to our post ‘Grow fresh tomatoes on your balcony’ as well. This entry was posted on March 28, 2013 by Paddocks in Gardening and tagged gardening, herb garden, kitchen garden, sectional title garden, sectional title property, twinings tea, windowsill garden.